2019Spring is the season that’s characterized by sunny weather, flowers, and warmth. It’s the season after winter and before summer, the period known for nature’s blooming. In this post, we want to tell you about springtime flowers to cheer up your home, when you’ll enjoy longer days and start dressing in brighter colors. One of the most striking aspects of this season is that the streets become adorned, and gardens and parks turn into a true show of beauty and color. Flowers bring joy and help us see things in full color. So, there’s no better way to freshen up your home than with the best springtime flowers. In this post, from Verdissimo, we’ll tell you about springtime flowers, even though these flowers aren’t necessary those that bloom in springtime. Instead, they’re suitable flowers and plants for decorating and gifting in springtime. Remember that although these flowers aren’t all in season, at Verdissimo you can find many of them because our products are preserved, which means that they don’t need water or specific weather conditions to maintain their beauty over time. A genus of plants in the Lamiaceae family, it’s one of the most popular plants for interior décor. Its simplicity and beauty make it a preferred flower for floral compositions inspired by nature, the outdoors, and meadows specifically. Rice flower, also known as white dogwood, is one of Verdissimo’s most popular filler flowers due to the volume that it brings to compositions. It’s capable of providing pretty accents of color and light to arrangements, as well as romantic, country, and bohemian touches that are difficult to obtain with other products. Also known as goldenrod, this plant is very well known for its medicinal properties and for being a natural greenery that’s used in compositions with a rustic air to them. Its shades of green and yellow make Solidago the perfect product for combining with many of Verdissimo’s different kinds of flowers and greeneries. What is more beautiful than a rose in spring? Nothing better to get away from the winter and start spring at home with a precious rose preserved. There is no better way to forget winter and to welcome spring to your home than with a stunning anthurium. This tropical plant, with its vibrant colours, will fill your home with life and freshness. They are indoor plants and thrive just as well in flowerpots as they do in large pots where they are mixed with other ornamental plants. This plant cannot tolerate the cold and needs to be watered constantly. It is a perfect ornamental plant thanks to its sinuous form and alluring smell. This plant, also tropical, is evergreen. However, in spring it becomes a very special ornamental plant as its minimal look with a Zen air will give your home a fresh and relaxed ambience. This plant can be kept outdoors or indoors. The only requirement in both cases is that it is not exposed to direct sunlight. It can tolerate high temperatures and cannot tolerate cold temperatures. This plant does not need a lot of water; it is sufficient to water it every two weeks approximately. Creeper plants liven and brighten up your garden. This spring garden plant grows very quickly and its branches will easily climb any surface. Their golden yellow colour will fill your home with life. Another of its benefits is that it provides freshness during the warm seasons. They are ideal for outdoors and, as they are climbers, they will decorate and cover walls and those “forgotten parts” like rusty or chipped railings. They can be exposed directly to sunlight without problems. Geraniums are one of the hardiest evergreen plants that we know of. Their variety of forms and colours has made them the kings of patios and gardens. Their scent does not come from the flower but from the essential oils that are found in their leaves. Geraniums can adapt to any kind of soil with the only condition being that they are not exposed to too much moisture. Although they do not have flowers, the Boston Fern is one of the most prized plants in home interior decoration. Their fine, slender leaves and their intense green colour provide colour and freshness to any indoor space. To show this plant’s full beauty, it is best to hang it. This beautiful and elegant plant will give importance to any indoor or outdoor space. Protect from direct sunlight. There are many different types of hydrangeas and all of them are perfect for interior decoration in spring, and even to give as a gift in springtime. You can find hydrangeas in a variety of colors, which greatly increases the possibilities of these flowers. Chrysanthemums are originally from Asia and northeast Europe. They’re beautiful springtime flowers used for interior decoration, gifts and even for creating floral compositions or even fashion accessories such as floral tiaras, floral belts, etc. Grabia is a country-style and rustic floral filler, suitable for decorating homes in springtime. We adore this filler because it makes spaces much fresher and more natural, as if the branches were freshly cut. Eucalyptus is originally from the Northern Hemisphere and it’s characterized by the shape of its leaves: alternating, wide and serrated. It’s another beautiful springtime flower, due to its natural and country-style appearance, though it fits into many different decorative styles. The tuberose is a flower from the Valerian family, originally from the Himalayas. Its soft colors make it the perfect flower for this season of springtime. It can be combined with other flowers or fillers, although it’s also capable of creating sensational looks on its own. Stoebe is a plant with a feathery and voluminous look. You can find it in different colors and also it has a rustic appearance that reminds us of small bushes. Spring is the perfect season for rustic-industrial or rustic-country style décor. To achieve either of these decorative styles, one needs to use natural materials such as wood and flowers and plants inspired by the countryside and meadows in particular. Rustic-industrial and rustic-country décor are best when they’re pure, that is to say, the décor is based on the purity of materials such as stone, forged metal, and wood. Currently, the trends in rustic styles follow a very eclectic line in which it’s very common to find modern elements, restrained elements, and those with straight lines all combined perfectly. With respect to colors, in rustic décor, the tones tend to be very soft and the flowers and plants have the role of adding touches of color and light to the spaces in question. 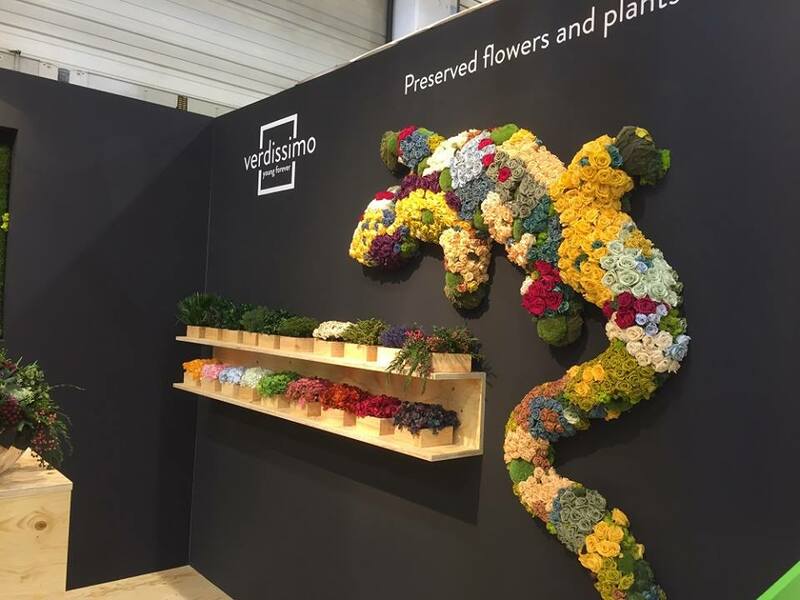 Verdissimo’s products are perfect for decorating your home in springtime due to the large quantity of country filler flowers that we have. In addition, all of our products last for a long time and retain their beauty for months or even years with practically no maintenance since they don’t need light or water to survive. Also with them, you can create lovely floral compositions like those we’ll show you in the image below, made of flowers in yellow, red, etc. At Verdissimo you’ll find an immense variety of preserved flowers and plants to inspire your imagination. We want to fill your home with colour and joy. For more than 25 years we have been specialists in floral conservation and in Floral Art. Come and visit us and discover the beauty of our floral decorations with fresh flowers or dried flowers. Preserved flowers can keep their fresh and natural appearance for months or years. They are perfect for long-lasting decorations and they don’t need to be maintained!